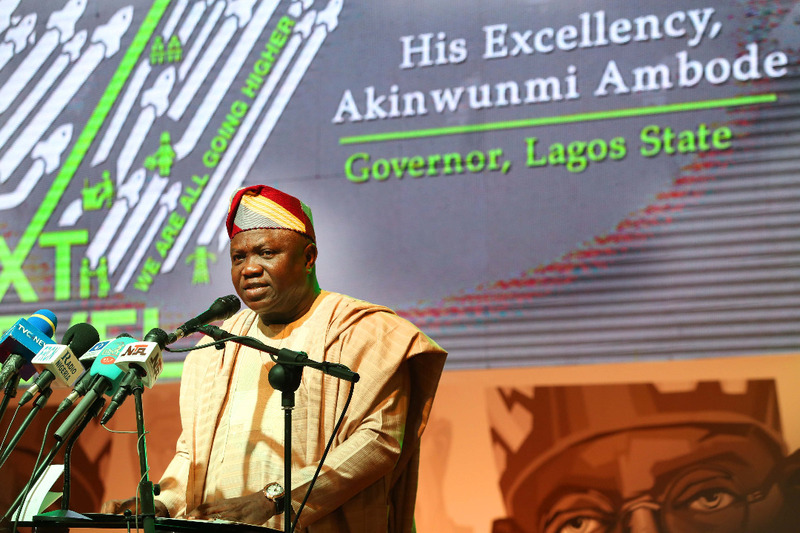 Lagos State Governor, Mr. Akinwunmi Ambode on Thursday saluted the role played by National Leader of All Progressives Congress (APC), Asiwaju Bola Tinubu in the re-election of President Muhammadu Buhari and Vice President Yemi Osinbajo, saying Nigeria was already on threshold of greatness with the duo in the next level government. 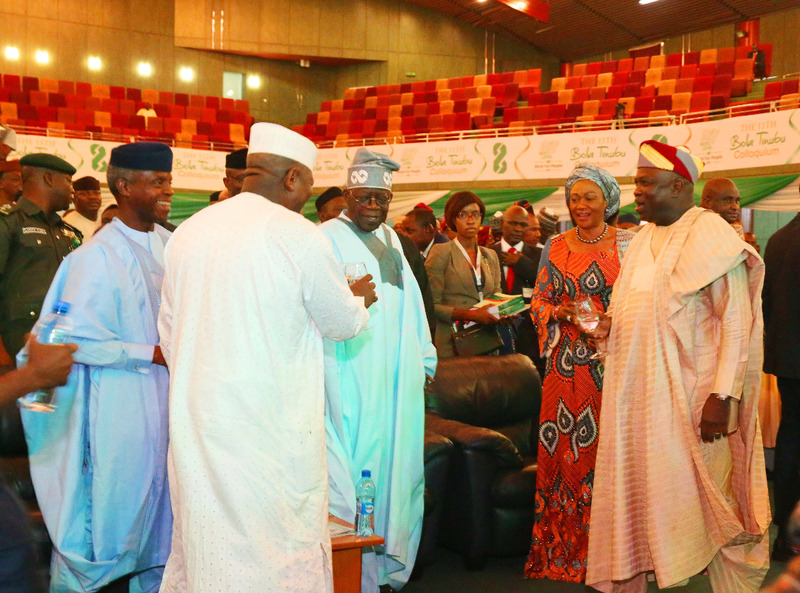 Lagos State Governor, Mr. Akinwunmi Ambode (right); Celebrant, Asiwaju Bola Tinubu (middle); his wife, Senator Oluremi (2nd right); Vice President, Prof. Yemi Osinbajo (2nd left) and Governor Abdulaziz Yari of Zamfara State during the 11th Bola Tinubu Colloquium at the International Conference Centre, Abuja, on Thursday, March 28, 2019. It is my profound pleasure to welcome you all to this 11th Bola Ahmed Tinubu Colloquium. 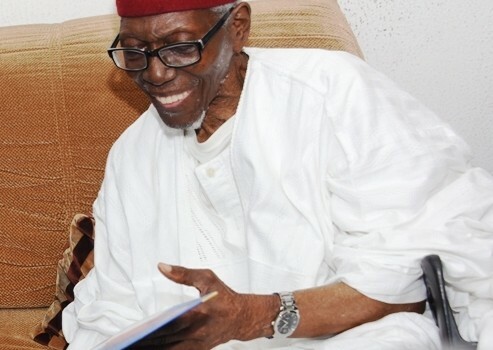 As I welcome you all to this event, I ask you to join me in wishing a very Happy Birthday to the man for whom we have all gathered today, a man of high political dexterity, the dogged National Leader of our great party, the All Progressives Congress, and a man of undoubted courage and political acumen. This year’s colloquium is coming at a time when Asiwaju Bola Ahmed Tinubu has spearheaded our Party to victory in the General Elections; at the Federal, National Assembly, Governorship and State Assembly elections. This colloquium is coming at a time when the APC has spread its progressive tentacles even further in the country. And this colloquium is coming at a time when Nigerians are eagerly looking forward to the Next Level in Progressive Policies, Economic Growth, Social Welfare and increased National Security. The theme of this colloquium; “Next Level – Work For People” is perfectly conceived as it fits the moment. We are all expectant and we can feel the Next Level unfolding. Our country is on the threshold of greatness because for the first time since our independence, we will have successive administrations of a progressive and visionary Government; a Government of Integrity; a government whose sole interest is the wellbeing of Nigeria and Nigerians. We are all lucky to be here in these exciting times; in a time when our country will be led by selfless individuals who have the progress and prosperity of our people as their major objective. And we are here today because Asiwaju Bola Ahmed Tinubu has been a very key part of this story. We are here not only to celebrate him but to celebrate the incoming dawn in Nigeria. We are here to celebrate the Next Level in Nigeria where Nigerians will be served and given what is due to them. Mr. President, Your Excellencies and all our distinguished guests, once again, I welcome you all and I thank you for honouring this invitation. The Lagos State Government on Wednesday urged eligible voters in the State to come out enmasse on Saturday to vote in the Governorship and House of Assembly elections, assuring that adequate measures have been firmed up to ensure a hitch-free exercise. Addressing Government House Correspondents after a Special State Executive Council Meeting at the Lagos House in Alausa, Ikeja, on the forthcoming polls, the State Governor, Mr Akinwunmi Ambode said every necessary arrangement to ensure a smooth voting exercise had been made, adding that the peace and security of the State was paramount to his administration. “I want to assure that we would try as much as possible to ensure that the coming elections – gubernatorial and House of Assembly elections go very well. We want to also assure all Lagosians of their safety and also to let everyone know that Lagos is a cosmopolitan State and it will remain so. “The peace and security of this State is very paramount to this government and we would ensure that everybody that is eligible to vote goes out to do so and keep the peace. The Governor, who is the Chairman of the State Executive Council, recalled the unfortunate incidences in some parts of the State during the Presidential and National Assembly elections, saying while such had been properly addressed, he would nonetheless want everybody to see each other as brothers. He also urged the people to support the governorship candidate of All Progressives Congress (APC), Mr Babajide Sanwo-Olu and all the House of Assembly candidates of the party to ensure continuity of good governance in the State. According to him, “We are also very aware of the incidences that happened during the presidential election of which we have taken proper care of. We know that we are all brothers; we are all the same in this State but I urge everyone to support our government and also support our candidate because we believe in continuity in this government and that is why you see that the executive arm of government is in support of Jide Sanwo-Olu who is our flagbearer for the APC. Besides, Governor Ambode who addressed the briefing alongside members of the State Executive Council, also clarified the news on social media to the effect that a public holiday had been declared for Civil Servants on Friday to prepare for the elections. “We like to inform all Lagosians that contrary to what has been put in the media that there would be a public holiday on Friday, what we have actually done was to declare mid-term holiday for students across all our schools in Lagos State,” the Governor said.